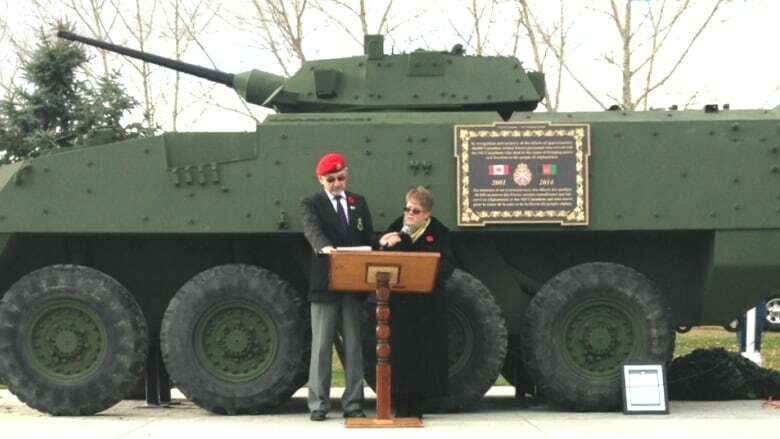 Dedicated to Alberta veterans and soldiers killed in the Afghanistan, NATO and UN conflicts, a full-sized, demilitarized replica of a LAV III was unveiled Sunday at Airdrie’s Nosecreek Valley Museum. Dedicated to Alberta veterans and soldiers killed in the Afghanistan, NATO and UN conflicts, a full-sized, demilitarized replica of a LAV III was unveiled Sunday at Airdrie's Nose Creek Valley Museum. "It's these young men and women, that's what it's all about," said retired Canadian Forces Sgt. Bob McNevin, who led the committee tasked with creating the memorial. "I did not realize how many veterans we have in the city of Airdrie." A veteran of peacekeeping missions in Egypt and Cyprus, McNevin said in a release it is time for Canadians to honour younger generations of veterans and their families. He called the LAV monument a way for the older generation to pass the torch of remembrance to veterans of more recent conflicts, such as Afghanistan and Bosnia. Retired British Armed Forces Sgt. Bill Drummond, a fellow committee member, said many people only associate the Legion with veterans of the First and Second World Wars. "I think it's a fitting tribute for the young fellas and women who put their lives on the line for world peace," he said. "To them, it means that they are being recognized, especially someone who has any kind of PTSD problems." The LAV III is a versatile fighting vehicle, able to reach speeds of more than 100 km/h. As a result, Canadians were "seen as the envy of all of the United Nations troops" because the LAV is "so adaptable," said Drummond. "They were used as ambulances, they were used as mobile offices, they were used for taking troops out to advanced outposts," he said. "And they were taken there in relative safety." Donations from Airdrie businesses covered a majority of the $70,000 cost of shipping the LAV III from Ontario and building the concrete pad for it to sit on.